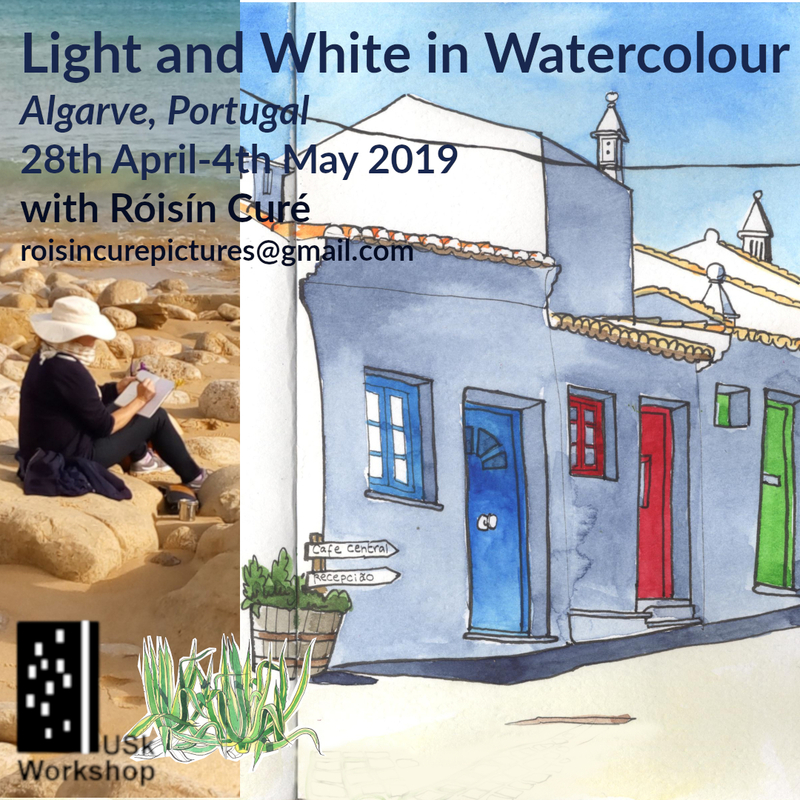 Join me in Portugal's beautiful Algarve this coming April for a week of sketching in watercolour. The coast of southwest Portugal is full of pristine beaches, pretty villages and big skies, sparkling in the late spring sun. We will explore how to reflect this shimmering light in watercolour, by learning simple techniques to get the most out of your paints, with loads of time to do it. I look forward to welcoming you into a small group with a maximum of 12 people as we travel within the workshop together, share meals and evenings in each other's company. The week is perfectly designed for the solo traveller or someone needing to unwind from a busy lifestyle, as it will be a quiet and calm time, before the main tourist season begins. There will be loads of time to put into practice the techniques you will learn, and the pace will always be unhurried. 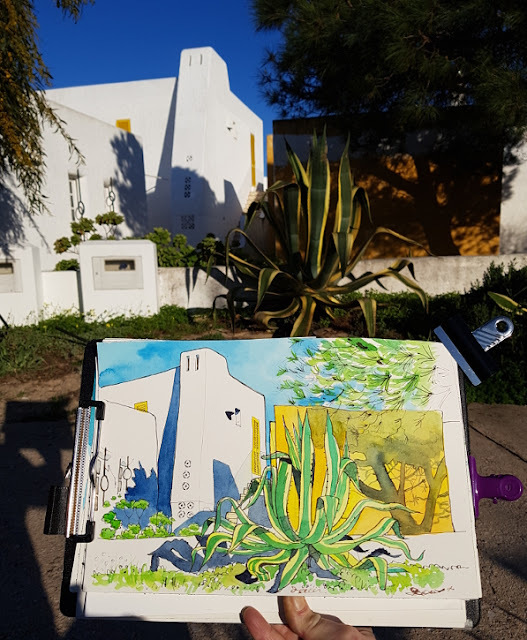 You will learn techniques such as leaving white - when and how; wet-on-wet; glazing; creative colouring and how to make colours pop. We'll explore clever ways to convey sea, paying attention to horizons and the sparkle of light on water. We'll explore reflections and how they differ from shadows on wet and dry sand, and different aspects of architecture in shadow. In short, all the things you'll find on your future holidays! There will be six days' tuition with careful explanations and demos beforehand. group discussions every evening. Workshop sessions every morning and afternoon, with one afternoon free for our excursion to Benagil Caves or to relax at home. We collect you from Faro Airport, provide transfers to our first stop and all travel within the workshop is included. Accommodation in a double room, breakfast and dinner, tuition, travel within the workshop. 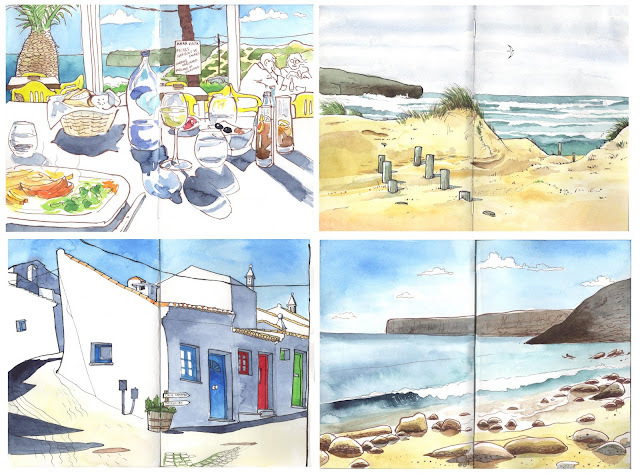 Travel to and from Portugal, beverages and lunch. We will spend the first two nights in Armacao de Pera, the following three nights in the quiet village of Aldeia da Pedralva and the last night again in Armacao de Pera. English, with French and Spanish translation available from Róisín for anyone who would like it. Contact roisincurepictures@gmail.com for more information or to book.